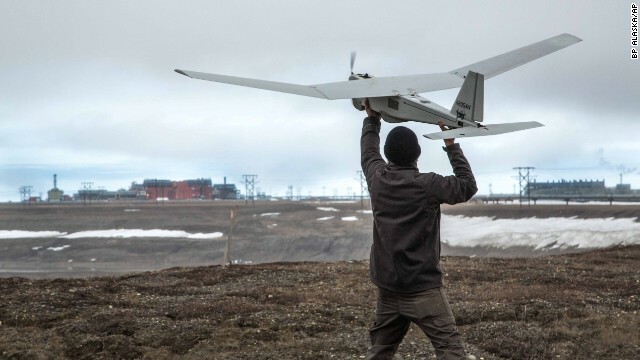 An AeroVironment Puma drone undergoes pre-flight tests in Prudhoe Bay, Alaska, on Saturday, June 7. The drone will be used to survey roads, pipelines and other equipment at the largest oil field in the United States. The Federal Aviation Administration has authorized BP to conduct the first-ever commercial drone flights over land, the latest effort by the FAA to show that it is loosening restrictions on unmanned aerial vehicles. 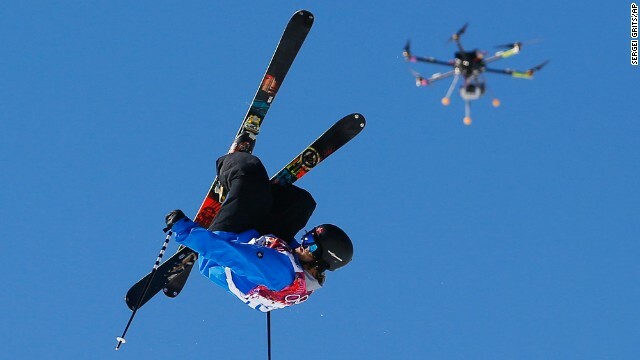 A drone camera follows Norway's Aleksander Aurdal during the men's slopestyle finals at the 2014 Winter Olympics in Krasnaya Polyana, Russia. 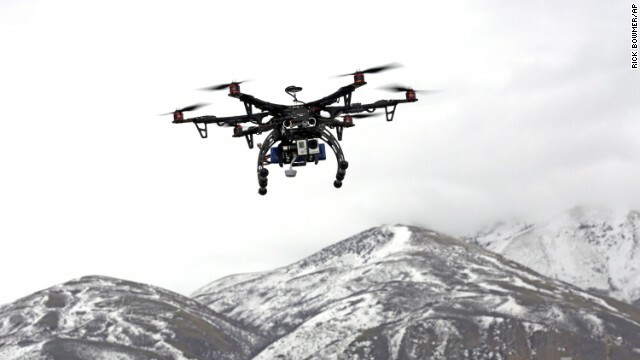 Members of the Box Elder County Sheriff's Office fly their search-and-rescue drone during a demonstration in Brigham City, Utah, on February 13, 2014. Gov. Gary Hebert has approved the state's first drone restrictions, setting new limits on law enforcement's use of the technology. Christopher Brown of the Next New Homes Group uses a drone to take aerial video of a home in Sacramento, California, on February 25, 2014. 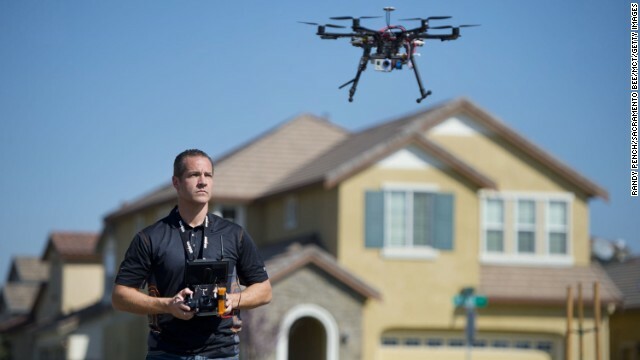 Drones are increasingly being used by small companies to shoot promotional videos. 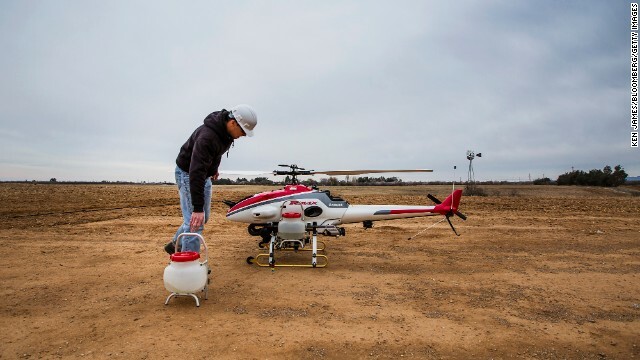 A researcher at the University of California, Davis, removes sprayer containers from a drone after a crop dusting test flight in Arbuckle, California, on February 5, 2014. UC Davis is testing the use of unmanned helicopters for agriculture. 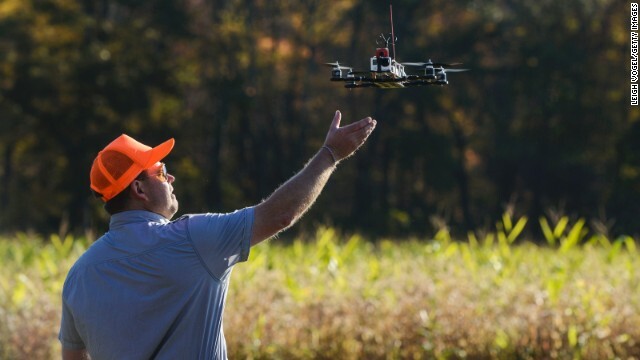 The FAA does not currently allow pesticide spraying from drones in the United States. 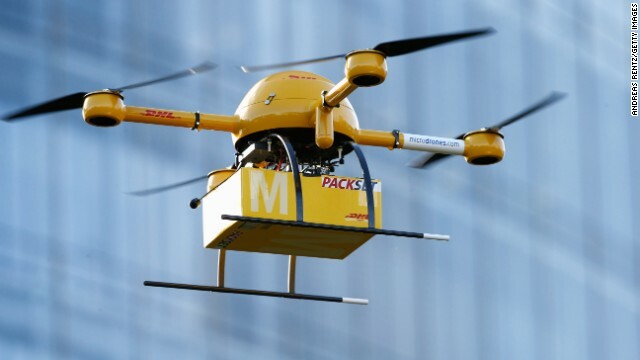 A drone delivers medicine from a nearby pharmacy to the Deutsche Post headquarters in Bonn, Germany, on December 9, 2013. The company was testing the viability of using drones to deliver small packages over short distances. Online retailer Amazon has also announced plans to start using unmanned flying vehicles. A drone designed to capture footage of illegal hunting activities lands after taking footage at Erwin Wilder Wildlife Management Area in Norton, Massachusetts, on October 21, 2013. A NASA Global Hawk drone sits in an airplane hangar during a Hurricane and Severe Storm Sentinel, or HS3, mission at NASA's Wallops Flight Facility in Wallops Island, Virginia, on September 10, 2013. 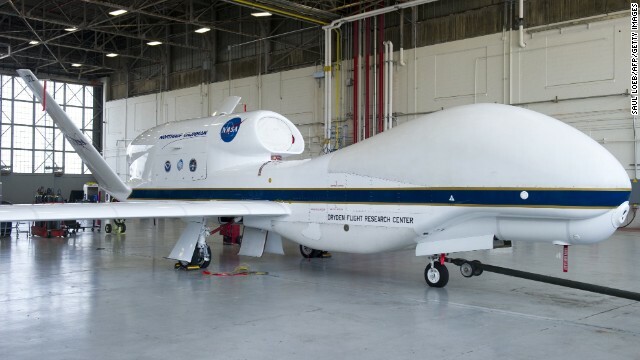 The HS3 mission uses two of the unmanned aircraft to fly over tropical storms and hurricanes to monitor weather conditions. 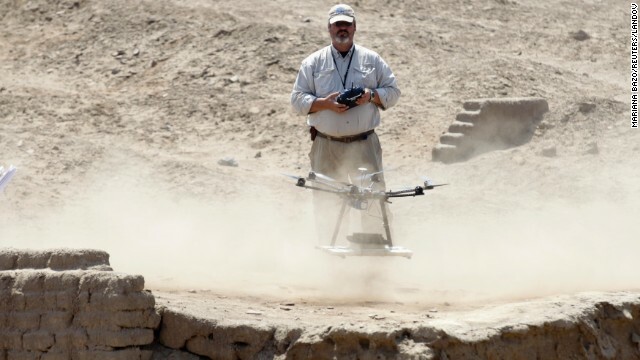 Luis Jaime Castillo, a Peruvian archaeologist, uses a drone to take pictures of the archaeological site of San Jose de Moro in Trujillo on July 18, 2013. In Peru, home to Machu Picchu and thousands of ancient ruins, archaeologists are turning to drones to speed up sluggish survey work and protect sites from squatters, builders and miners. 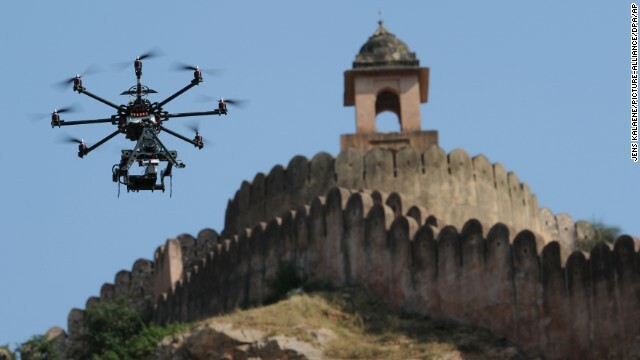 A drone fitted with a film camera shoots aerial footage during the production of the film "The Girl with the Indian Emerald" in Jaipur, India, on November 7, 2012. While it's already being done in other countries, the U.S. government is considering a request from movie and TV producers to let them use unmanned aircraft to shoot aerial video. 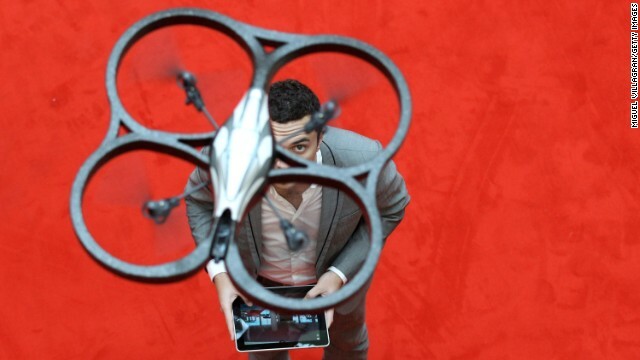 A man controls an Parrot AR Drone with an iPad during the press preview day of the International Toy Fair in Nuernberg, Germany, on February 2, 2011. 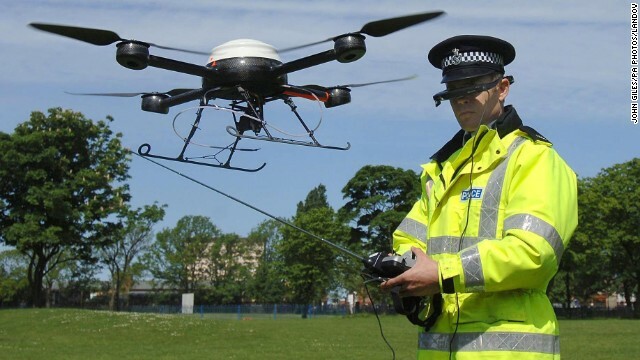 Derek Charlton of the Merseyside Police operates the department's new aerial surveillance drone in Liverpool, England, on May 21, 2007. An MQ-9 Reaper, armed with laser-guided munitions and Hellfire missiles, flies a combat mission over southern Afghanistan. The Reaper has been in use since 2007. U.S. Marine Sgt. 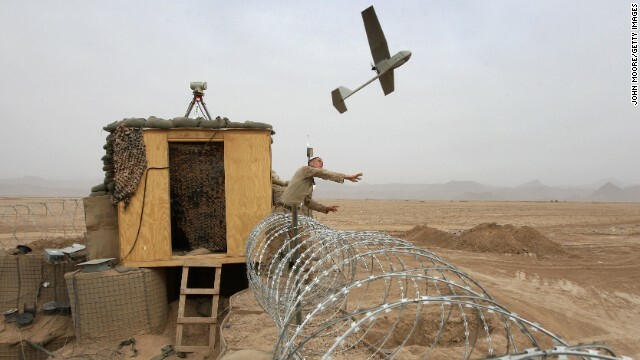 Nicholas Bender launches a Raven surveillance drone from Marine base near the remote village of Baqwa, Afghanistan, on March 21, 2009. Marines use the unmanned aerial vehicles to get real-time intelligence on Taliban movements. Editor's note: Peter Bergen is CNN's national security analyst, a director at the New America Foundation and the author of "Manhunt: The Ten-Year Search for bin Laden -- From 9/11 to Abbottabad." Emily Schneider is a research associate at the New America Foundation. (CNN) -- Over this past weekend, Hezbollah, the militant Shiite group that is headquartered in Lebanon, reportedly used drones to bomb a building used by the al Qaeda affiliated Nusra Front, along Lebanon's border with Syria. 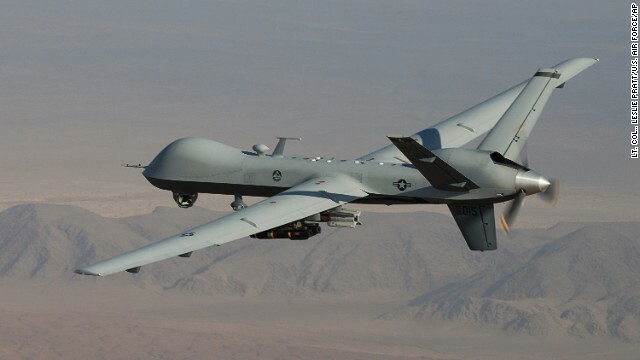 The armed drones, combined with fire from Hezbollah ground troops, killed 23 Nusra Front militants and wounded some 10 others, according to a report by an Iranian news agency. Iran is the key sponsor for Hezbollah and has plausibly claimed for the past several years to have succeeded in manufacturing armed drones. Hezbollah's use of drones marks a milestone for terrorist groups worldwide: It would be the first time a group other than a nation state used armed drones successfully to carry out an attack, marking an important step towards closing the gap between the technological capabilities of countries such as the United States and militant groups such as Hezbollah. After all, it was only in the months immediately after 9/11 that the United States mastered the technology of arming drones and began to use them in combat. Now, 13 years later a militant organization appears to have reached the same milestone. Previously, drones were known to have been used by militant groups only for surveillance purposes. Last month, ISIS uploaded a video to YouTube that showed aerial views of Syrian Army Military Base 93 in Raqqa province in northern Syria that had purportedly been shot by a drone. Libyan opposition fighters targeting Libyan dictator Moammar Gadhafi used sophisticated drones for surveillance in the summer of 2011. Hezbollah had used drones for surveillance before, but the drones were used on Lebanon's border with Israel. In April, the Israeli military said it had shot down a drone off the coast of Haifa and that Hezbollah operated it. Although Hezbollah denied responsibility for that drone, it did claim that it had operated another drone that flew 35 miles into Israel in October. If Hezbollah does indeed have armed drones, it joins an elite group of nations: Only the United States, United Kingdom, and Israel and are known to have deployed armed drones in combat. According to a count by New America, some 80 countries have some kind of drone capability -- but few of them have succeeded in arming their drones. Russia, China, and Iran possess armed drones but have yet to use them in combat. Hezbollah's use of drones to target another militant group shows how warfare is changing: The monopoly of states on the use of military force is eroding, and new technology is leveling the playing field between states and militant groups. So what can the United States and other nations do to protect themselves from this dawning threat? It's a subject, of course, of great interest in Israel where accounts of Hezbollah's drone strike on the Nusra target over the weekend were all over Israeli media during the past 24 hours. Most armed drones are relatively easy to shoot down if you have a sophisticated air defenses or a fleet of jet fighter aircraft. Western countries generally have these, but one can imagine a dystopian future where terrorist groups are able to deploy armed drones against less well defended targets. Indeed, that future may have already arrived.